Electronics is one of the most difficult parts of the project. It is impossible to integrate the original system into the new design, but we didn't want to leave it in sight. The only solution in our case was to build a new network on 'motogadget' digital components. Let's llok at each element connection. Placing the controller is not an easy task. It is best to place all components close to the battery in the tail (wiring will be shorter), but we do not have enough space under plastic, so we decided to install the M-Unit under the tank, and the starter and charging relays near the battery. This way we had to pull the long power wire to the controller, but the spit from the headlamp and remote controls got shorter (if the M-Button relay is not used). Two or three pushbutton controls would be enough to provide all the necessary functionality thanks to programmable commands. For example, for switching on / off the high beam and blinking one button is used: short pressing and delayed pressing. To turn on the hazard warning lights there is no separate button, because it is activated by simultaneous pressing the turn signal buttons. Engine start and soppage is also controlled by one button: pressing with a delay - engine start, double pressing - engine stoppage. At first we did not want to use this relay, but after connecting the consoles, we decided to install them in order to hide the connectors in the headlight. Without the M-button, there are too many wires between the frame, the headlight and the consoles. It is less reliable and doesn't look good. We have to install suitable control relays on motorcycles with a radiator fan and fuel pump. Conventional electromagnetic relays are very big and must be protected from vibrations and water. In our case M-Relay motogadget was the best solution, because it is vibro and waterproof and you can screw it to anywhere. The original speed sensor does not fit, so we used the one that was in the package from 'motogadget' with the dashboard. We placed on the rear wheel, because we wanted to make it less noticeable. Low fuel level, charging, oil pressure - they all work from original sensors and are connected directly to lights. K1100LT has a gear meter, so the indicator of neutral cannot be connected directly. We made a simple circuit with two control relays (we bought the smallest of 12 volts, that we found). A reliable way to protect this circuit from water is to fill it with epoxy. The original temperature sensor changes the resistance depending on the coolant temperature and is connected to a separate dashboard, where an alarm goes to the main device from. We only need a hazzard light, but without additional dashboard it was difficult to make it (a separate circuit is needed). The easiest option is to buy a switch at 100 degrees with M10*1 thread and connect directly to the light. The front and rear brake systems are built from scratch, so we used sensors integrated in the banjo-bolts. The front brake sensor connects to the M-Button relay and the rear sensor connects directly to the M-Unit. The wires from the engine control unit can be substantially shortened and reduced. Only power wires go into the M-unit, there are also control wires for the fan and the fuel pump, which are connected through a relay. The main problem is that the wires are filled with glue, and it is difficult to disconnect them without damaging the braiding. To connect the wires we used plastic connectors, the same as the factory ones. To connect the rear optics we used a hermetic connector, even though a protective plastic tray was made. In our circuit, the number of connectors could be significantly reduced, but we decided to make each element and wiring segment disconnectable - this is important for a custom bike, because you cannot buy such wiring ready to use. The M-Unit has short-circuit and overload protection, so only one main fuse per controller is needed. If an M-Lock is used, it is connected through another fuse. The magnetic lock is a good solution due to its compactness and ease of placement. For a mechanical lock, it is necessary to provide mounting on the traverse, to stretch the wires, but the magnetic one can be hidden anywhere. 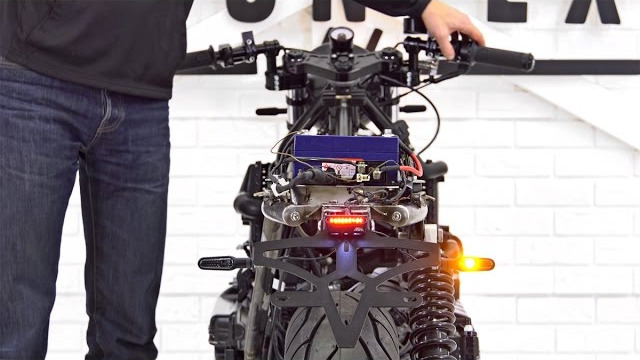 Motogadget digital components are the easiest and most reliable way to do electrics on a custom bike. They are so compact that you can fit them under a tank or in the tail. They can be used not only for a motorcycle, but also for a car. The following video shows how we did it and the circuit that we got on the K1100SX.